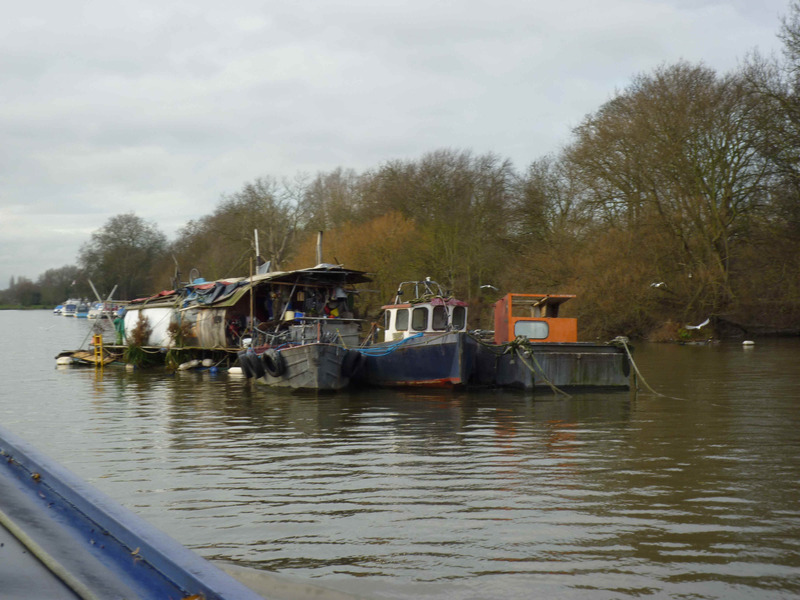 The forecast was set fair so we set off to the boat – the rain’s finally let up and the Thames is slowly becoming navigable again so we headed west. I dropped Richard and the dogs off at the boat – predictably enough she’d been fine at the mooring though interestingly, the single pins that I’d used had been dragged through the soft towpath and were barely clinging on; the ‘interlaced’ pins had stayed put, so maybe it does make a difference. I’m surprised that the pins had dragged – the water on the Grand Union was crystal clear – an indication that there hasn’t been much traffic to stir up the mud. I headed off to Teddington (or rather, Ham, which is just across the river from Teddington proper) to drop the car off within easy reach of the lock moorings. This is where we’d be finishing our cruise tomorrow. Public transport from Teddington back towards Bulls Bridge (our rendezvous) is a bit hopeless so I caught a cab instead – a reasonable £20 and perfectly timed to allow me to stock up in Tesco’s Bulls Bridge before Richard picked me up on the boat. 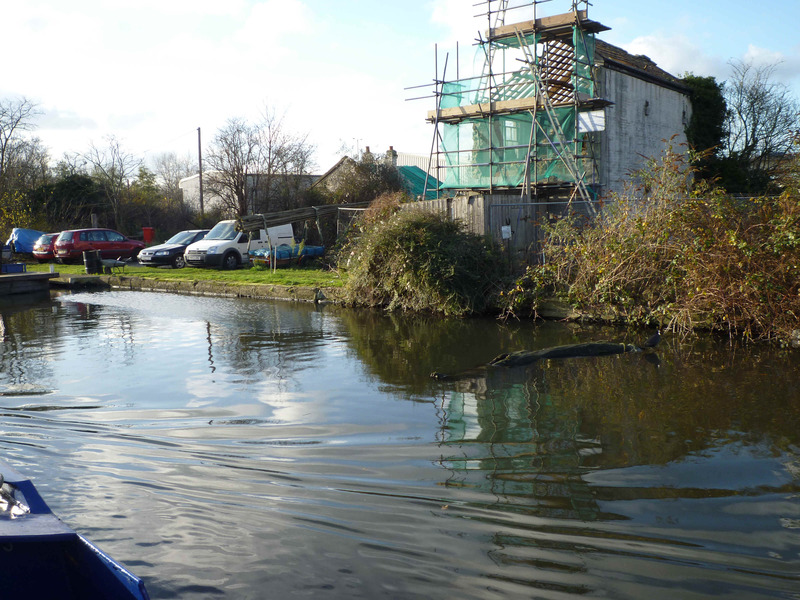 While I was doing the car shuffle, Richard set off down the canal, going past the worryingly full moorings at Black Horse, giving Engineers Wharf a wave, stopping in Willowtree Marina for fuel (our split calculation was 70/30 this time) and a very well done pump-out. 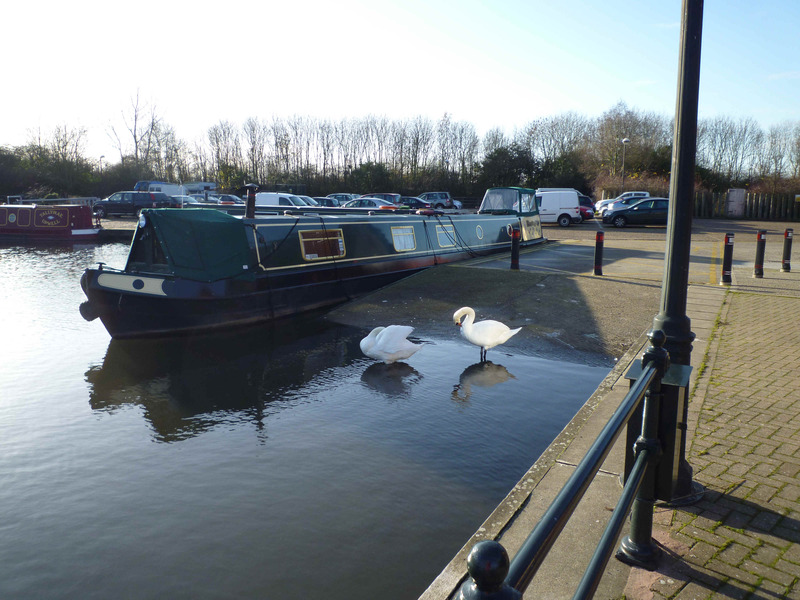 We like Willowtree and saw a fine looking Marmaduke there – they must have shifted a bit to come across from Stourport as it does not feel that long since we read the sad/happy news that she had been sold/bought. Simon was delightful company and we had one of those wonderful days just ‘messing around’ on the water. Having an extra crew member was a good start, but the flight itself was as sociable as ever – no other boaters on the move, but there were a few walkers. Blue and Lou had a wonderful time – Blue explored the length of the flight; Lou ran a bit then rested a bit – very sensible as her arthritic knee has been troubling her recently. She was very well-behaved with other dogs today and managed to have a friendly rummage with a little staffie with NO barking or chasing – result! I’m always excited when the canal water clears – I always imagine that I’m going to see all sorts of wonders under the surface. 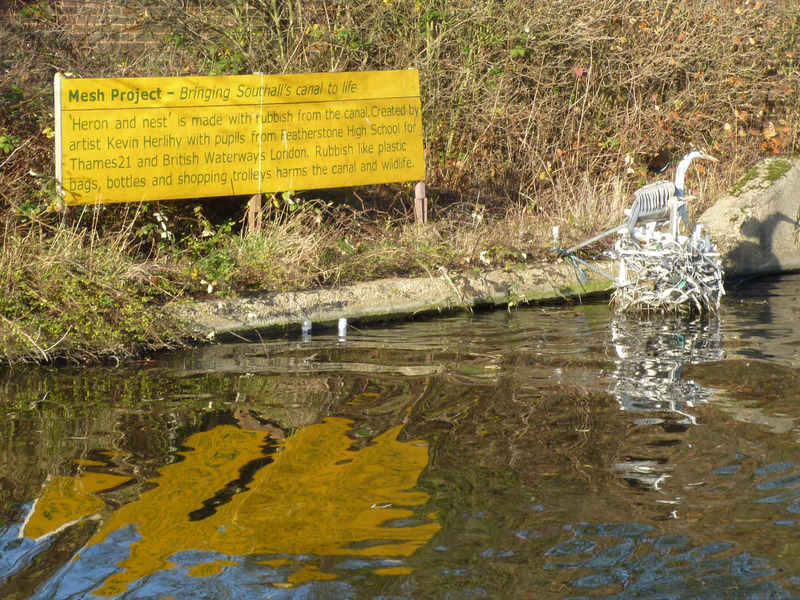 Golden Wonder maybe – what you mainly see on the Hanwell flight is submerged crisp packets! It is good to be able to see what’s in the water – I was able to avoid picking up some of the larger bags in the prop, though I came a cropper with a length of clear plastic which was invisible. Simon did a sterling job of picking rubbish out of the locks – the coal sack that he originally plucked from the water was soon filled. 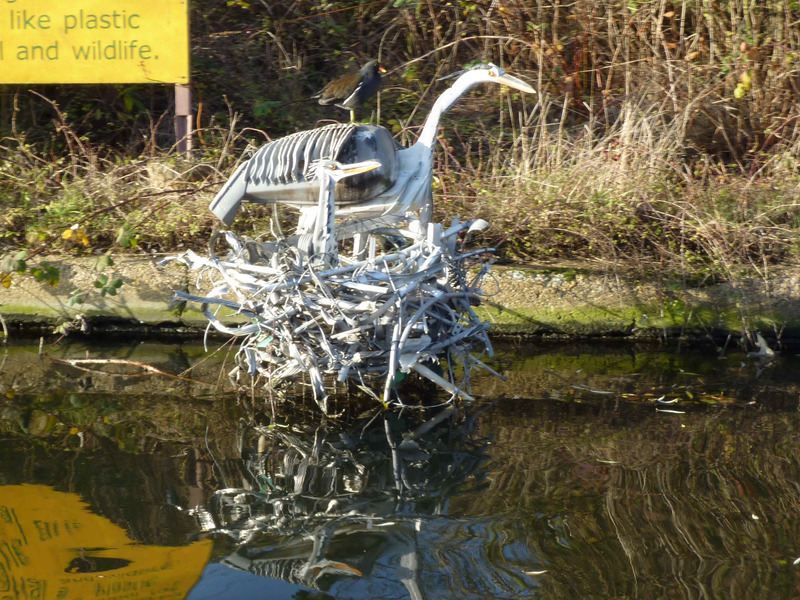 There’s more trash in the water above Clitheroe’s lock – bits of tree as well as footballs for some reason, probably carried there by the River Brent (as Simon later explained). There were many positive aspects to having Simon’s company, not least his suggestion insistence and demand that we stop being teetotal and stop in The Fox for a quick half pint on our way down the flight. (Note from Sue: I had diet coke!). The Fox has been highly recommended to us by a few boaters but we’re so used to being on the move that it’s never really occurred to us to stop. But with Simon’s local knowledge we found a good spot to moor and found the pub, which is slightly off the canal just below Lock 97. The pub is very cosy and dog-friendly – we didn’t eat here but we’ve heard that the food is very good. We got settled in and it’s so companionable that I could well have sat there for the rest of the afternoon and evening. But we were booked to go onto the Thames at 10.15 the following morning and we’re not that reliable before 11am so we thought we’d better press on to Brentford. There’s a longer gap between the last two locks down to Brentford so Simon finally got to come on board! Despite my ground crew’s herculean efforts, it was still pitch black by the time we arrived at Brentford. 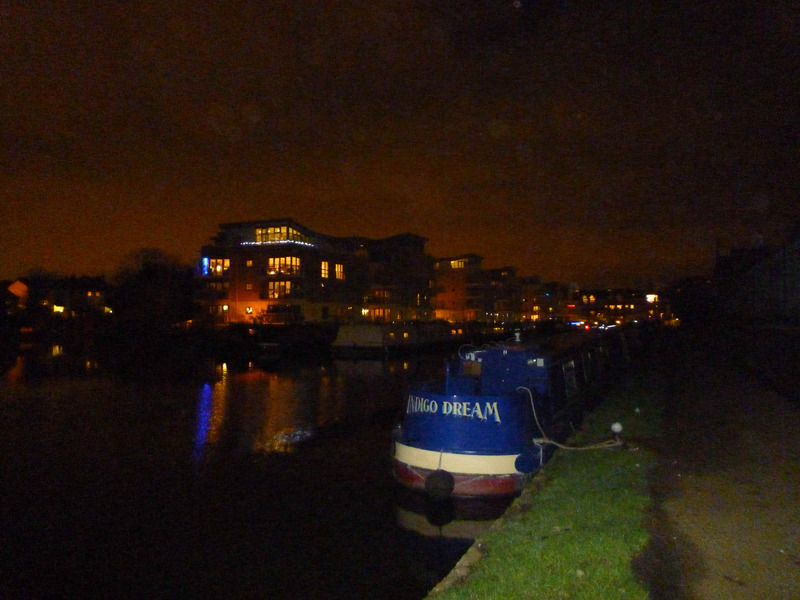 The water was dark but the buildings around us were brightly lit; the moorings were illuminated by some bright blue Christmas lights strung along the roof of one of the residential boats. In the half-light, the sounds were strangely amplified – the rush of the planes taking off from Heathrow, the nearby trainline and the roar of the football crowd from Brentford’s football ground to the East, echoing off the buildings to the West. 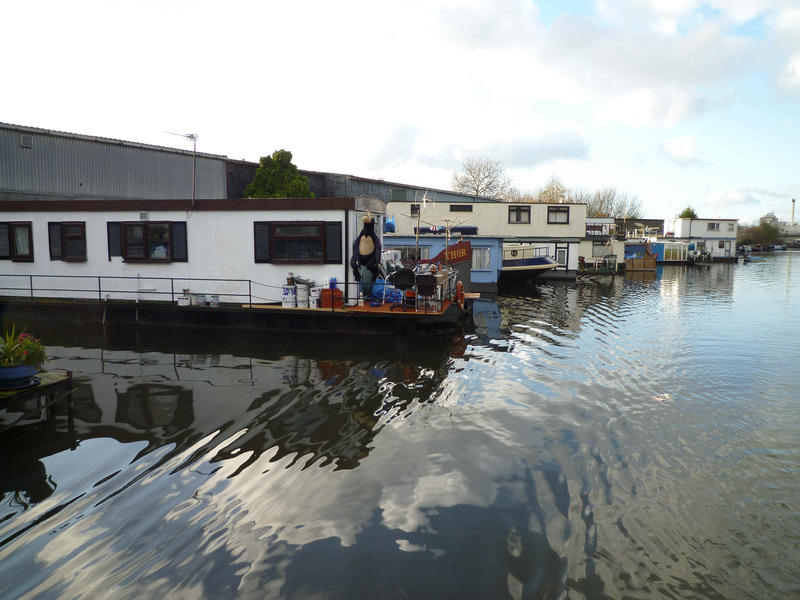 We were alarmed to find that there’s now only one visitor mooring here (occupied) – the rest have been given over to winter moorings. This left us with an ethical dilemma, made harder by darkness, fatigue and cold. 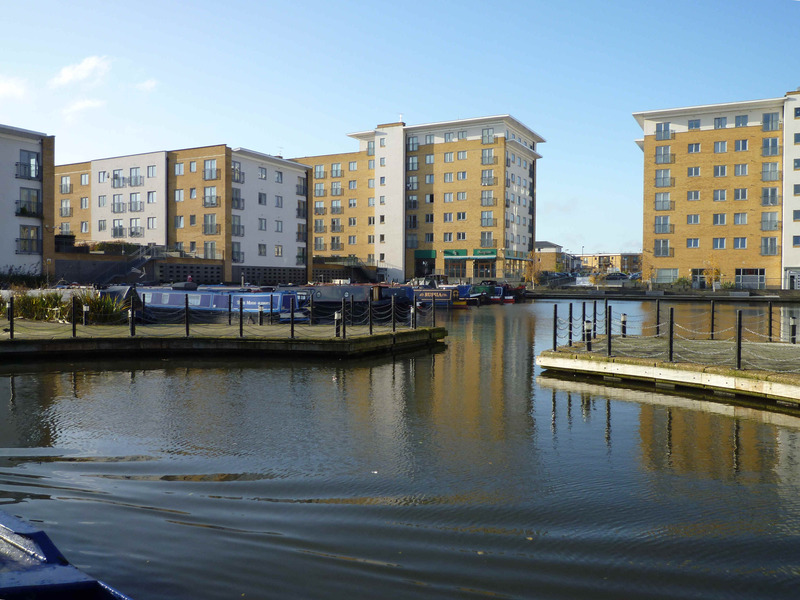 We needed to moor in Brentford to catch the tide in the morning. 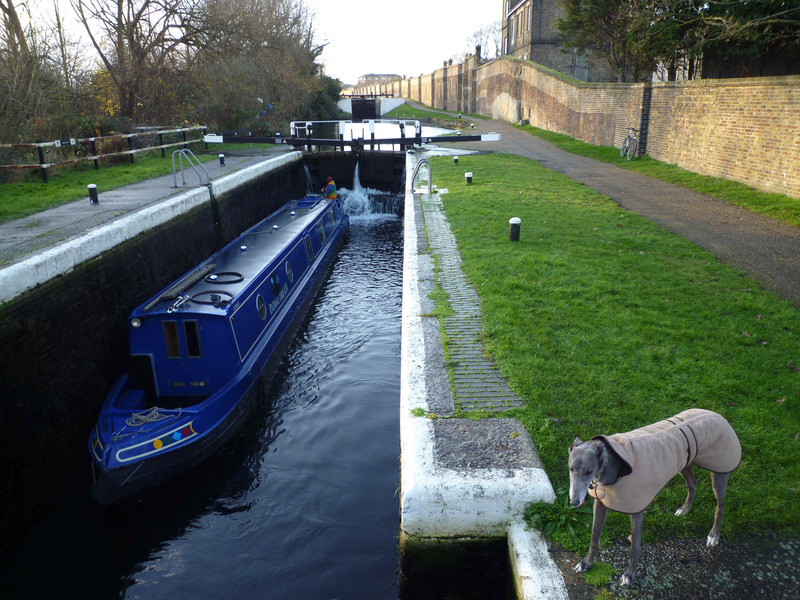 The moorings below the gauging lock are too high for offloading the dogs; there was one empty spot not taken up by a winter moorer (we knew there was a vacant space there from our own investigations into winter moorings) or we could take the water point or moor underneath the overhanging ‘warehouse’ (which we weren’t sure is allowed). In the end we guiltily took the winter mooring at the end of the line, hoping that no-one else came down the flight behind us in the dark. Having recommended the Fox earlier, Simon’s local knowledge came in useful yet again as he directed us to the best pubs in Brentford. 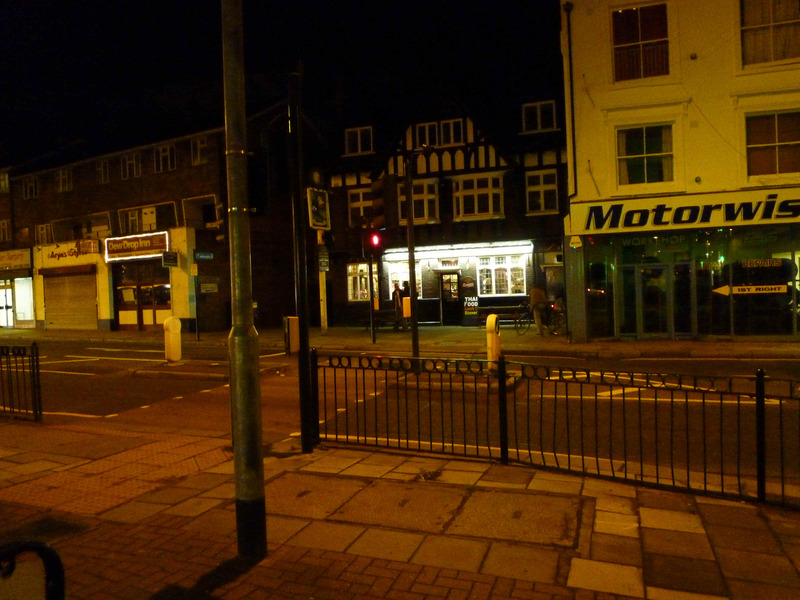 We spent the early evening in the Crown and Magpie (across the canal on the High Street). It’s a small cosy pub with a wide-range of ales and ciders on tap, including strawberry and cherry beers (the latter looking deceptively innocent, being the same colour as Ribena!). We’d left the dogs on board, but we found out later that this pub is dog friendly – it’s certainly people-friendly – there’s a good atmosphere, beer and food – the Thai menu was very simple but subtly flavoursome – delicious. 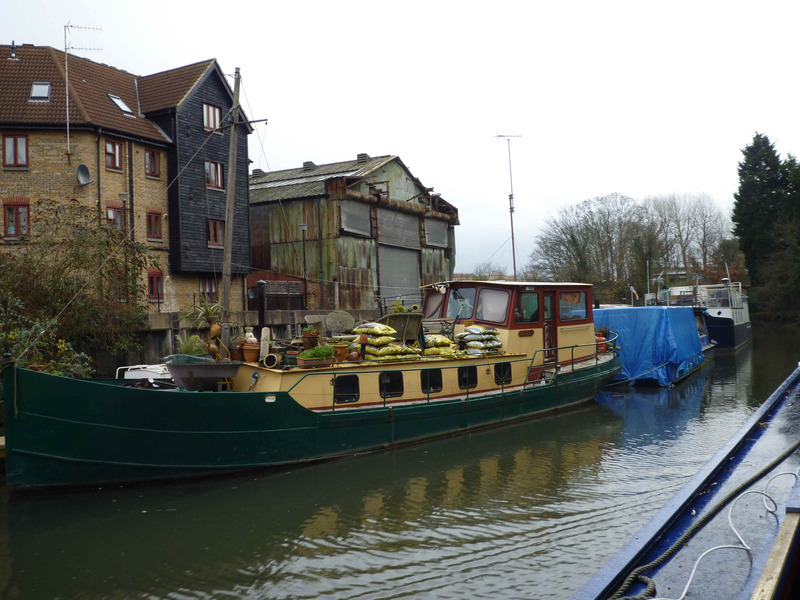 We wandered back to the boat well-satisfied and full of goodwill towards Brentford, although it doesn’t always make its charms obvious to the casual visitor! 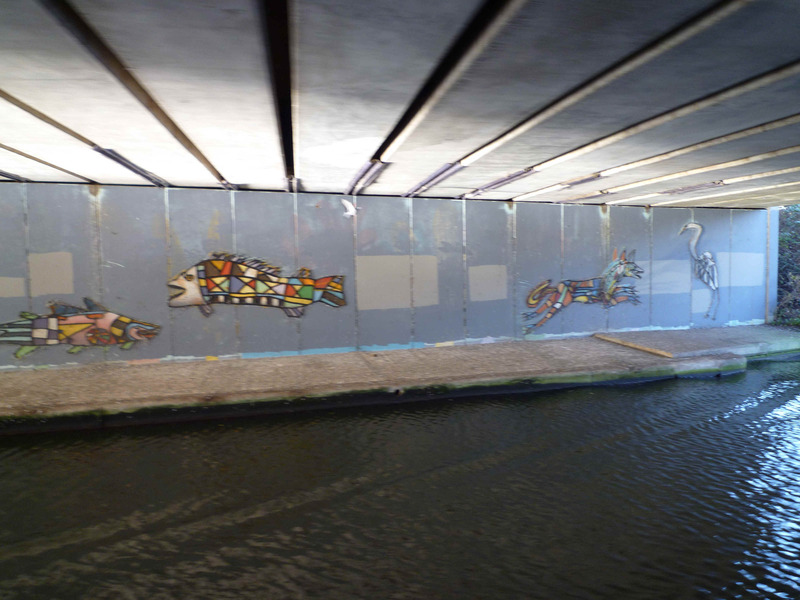 The dogs gave us an ecstatic but brief greeting – they were exhausted after a busy day on the canal. We were too, and by 10pm we were all tucked up in our respective beds. 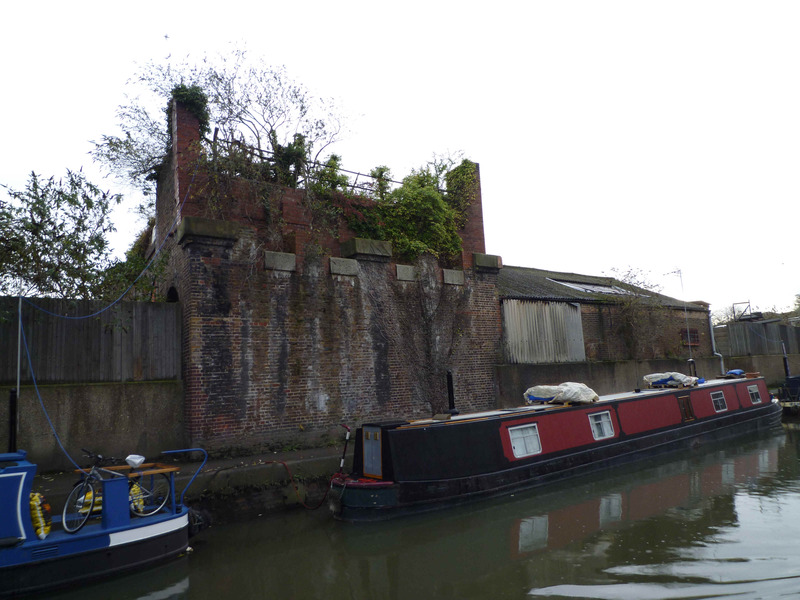 Property restoration at Bulls Bridge - is that an old BW building? One of the nicest spots on the flight, and so close to the prison! 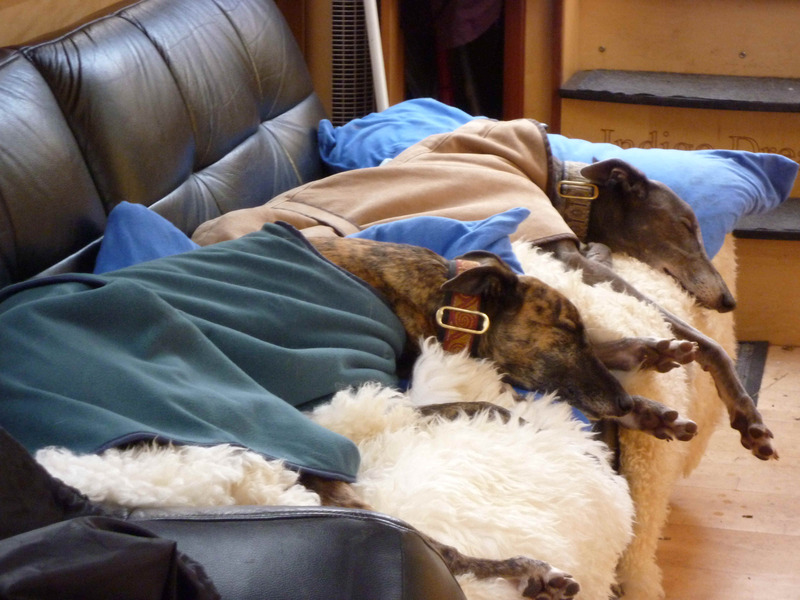 Blue and Lou are well-wrapped against the cold - it was a lovely day but seriously brass monkeys! We had a quiet and peaceful night on the moorings though, very unusually, I woke up before the alarm. 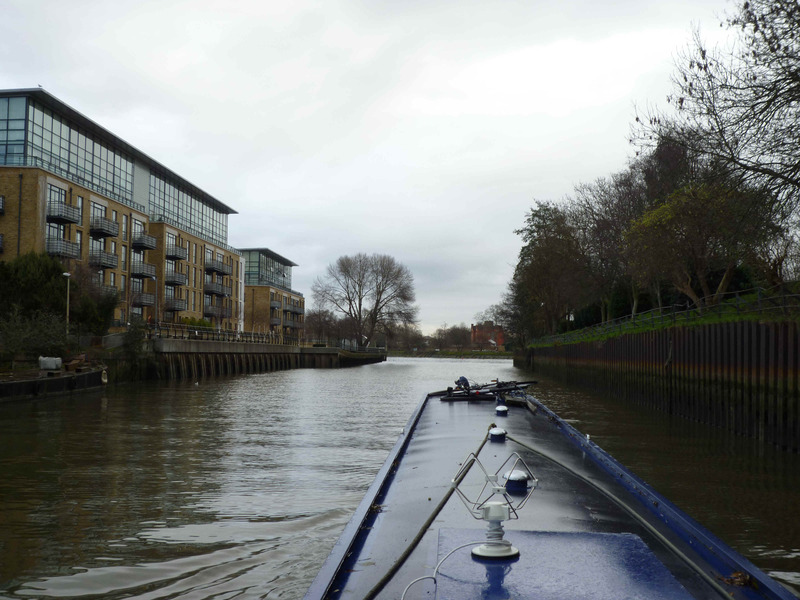 Even more unusually, we were up and away from the moorings early – just as well, we needed to fill with water and we couldn’t remember what the pressure’s like in Brentford (not very good, as it happens!). We approached the water point with a bit of trepidation – nb Leo (we think that’s her name) had come in and moored there a couple of hours after us last night. I was afraid that we’d ousted them from their proper spot, but it turned out that they were visitors too – booked to lock onto the river at 11am. We brested up to them to fill with water – they were so courteous and helpful. As we pulled in, an amazing number of heads seemed to pop into view at Leo’s windows – they were a large group of friends out from Kings Cross and doing a weekend jaunt round the London Ring. I’ve always considered the Thames Tideway to be a means to an end and not suitable for a frivolous jaunt. The more I talked to our neighbours the more I thought that it might be a very fine weekend adventure. 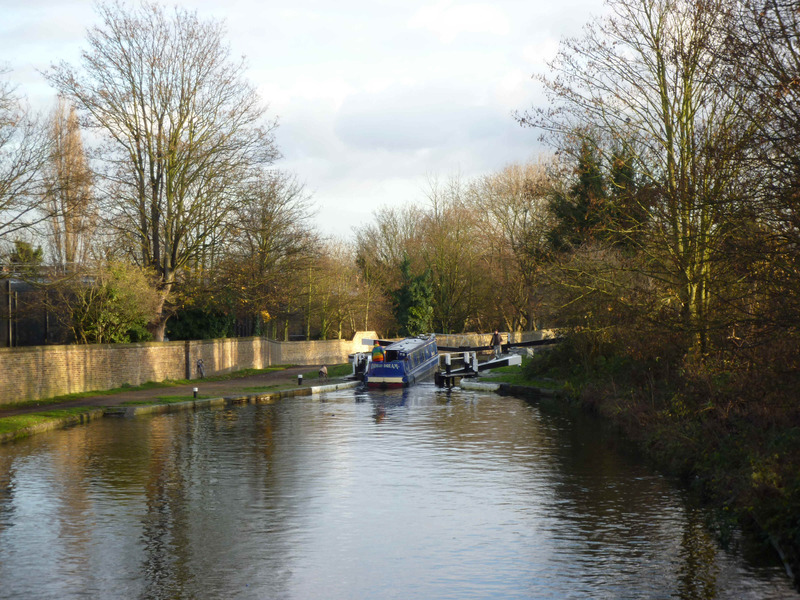 But not this winter – by the time we’re ready to come back onto the canal the stoppage at Victoria Park will have broken the ring until March. Maybe in the Spring…. I was cheered by our chats with the crew of the Leo and we set off down the gauging lock in good spirits. 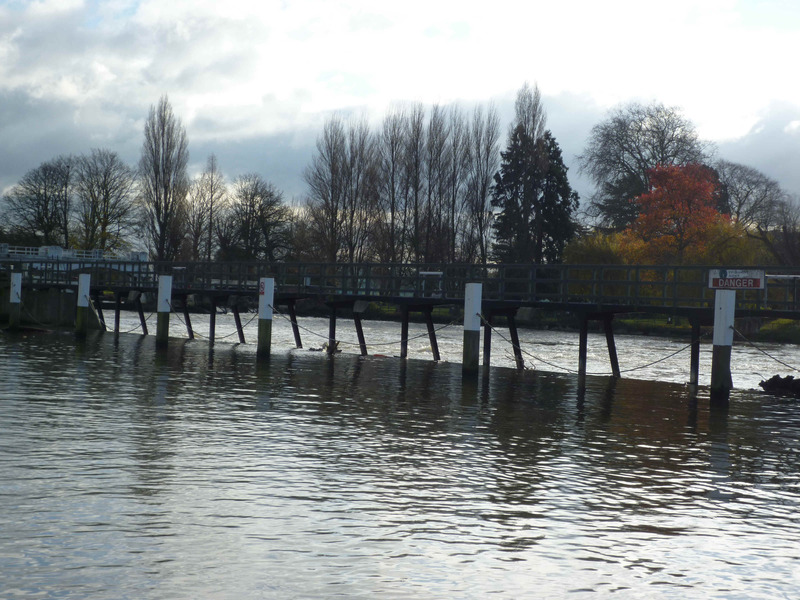 The mooring pontoon below the lock is now complete and is such an improvement on the previous arrangement. I was pleased to see that the pontoon’s made of proper non-slip wood decking rather than the horrible hard plastic that they’ve used on the Weaver. I was fascinated by the sudden appearance of a flock of seagulls as I opened the lock sluices. They seemed to be enjoying the flow and bubble of the water – I wondered whether they were missing the sea! 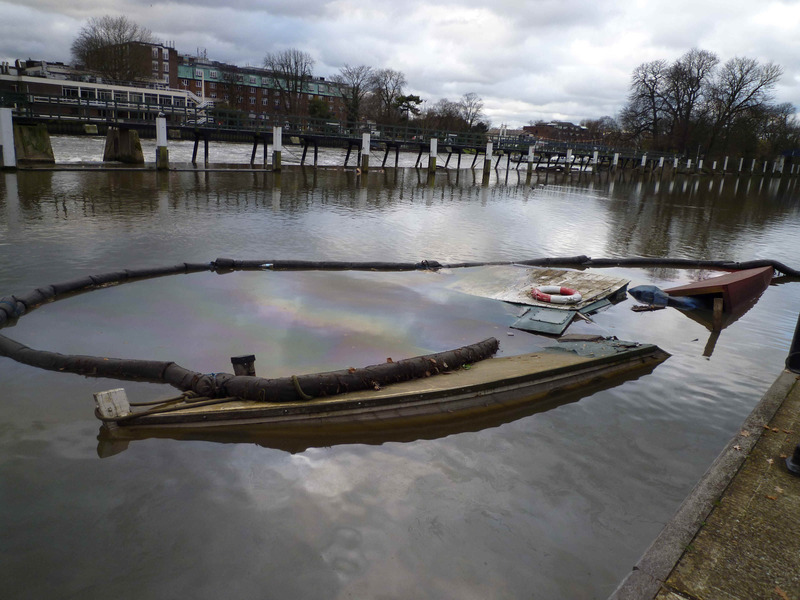 I’ve not seen this phenomenon before, but it happened again at Teddington Lock. The lockie told us that sometimes the turbulence throws up a fish or two – enough to bring the seagulls flocking. 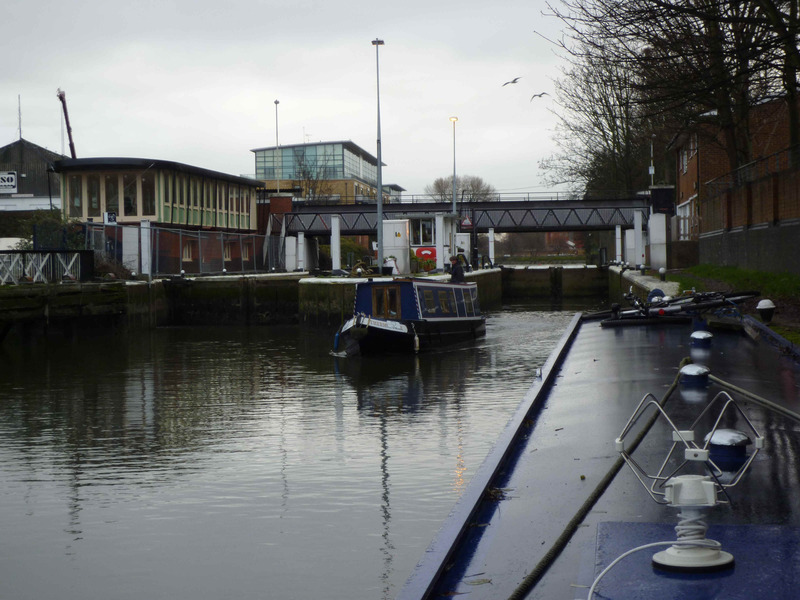 from the River Wey was just locking up to the canal – they were able to reassure us that conditions on the Thames were ok. Then it was our turn to lock down. I stayed at the front of the boat as a lookout for the turn onto the river – I’d thought it was academic as I couldn’t imagine there being many boats on the river on a freezing December morning. I was wrong! 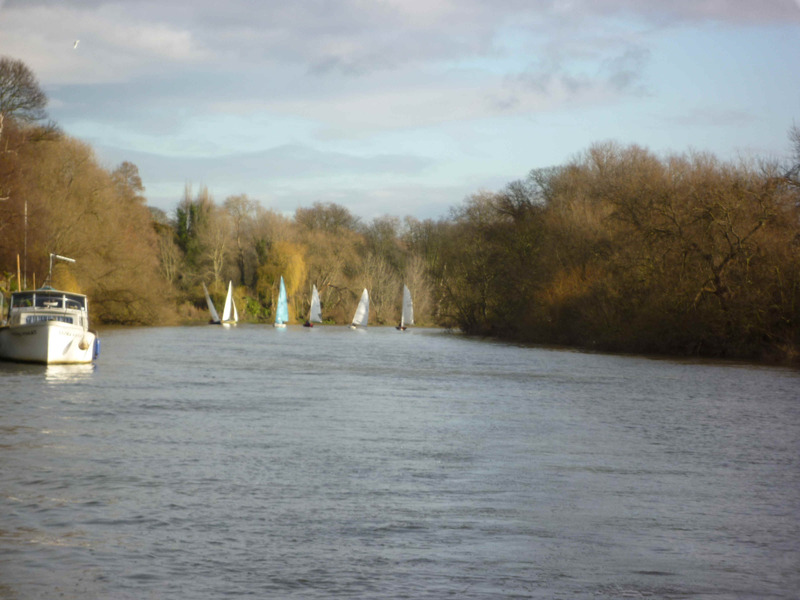 There was a positive regatta of rowing boats and canoes on the river – fortunately they move a lot faster than us so they’d disappeared by the time we got onto the river proper. It’s always interesting to come onto the river – there’s absolutely no doubt about where you are – the sense of depth and movement is unmistakable. We were on the river proper before I suddenly realised that none of us were wearing our life-jackets – I hastened to put them on. I was shocked, I normally approach the tidal river with an advanced degree of paranoia but this time I wasn’t at all worried. I’ll have to watch out for that – there’s only a thin line between confidence and complacency! Mind you, the numerous rowers on the water didn’t have a single buoyancy aid between them though they did have a watchful safety boat! As always, we enjoyed our trip up to Teddington. 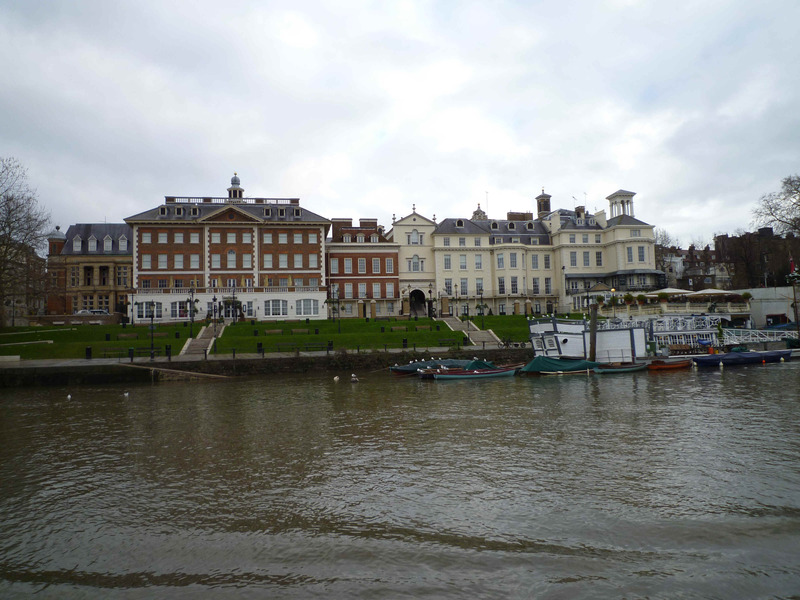 The Thames is so grand here and everything’s on a lavish scale; the river’s wide, the banks are flanked by extravagantly ancient woods, exclusive modern apartments and vista’d manor houses looking down their noses at the riff-raff on the river . The river flaunts its wealth so conspicuously that the occasional flotillas of moored boats and the hermit’s heap of junk (which seemed to be on a different mooring now) felt like a welcome little rebellion. 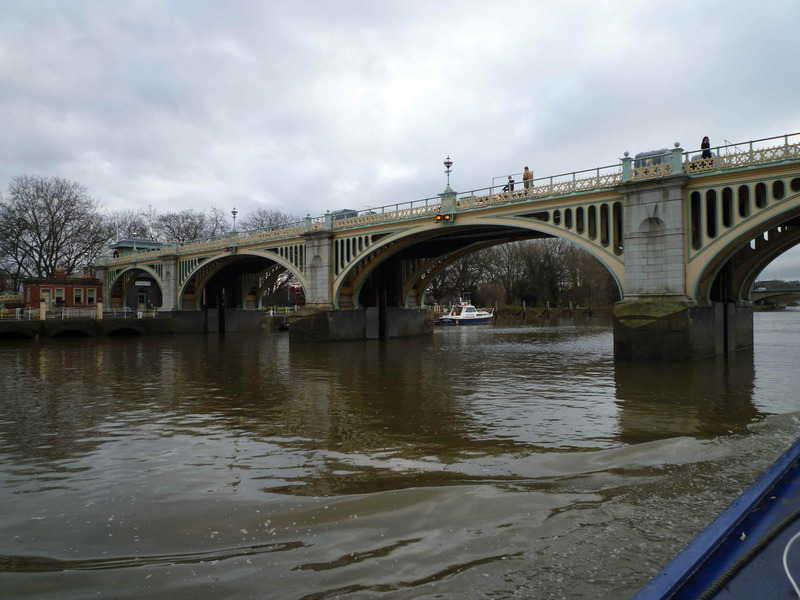 I was almost sad to arrive at Teddington Lock – the river’s so interesting and it was such a crisp morning – perfect for cruising. 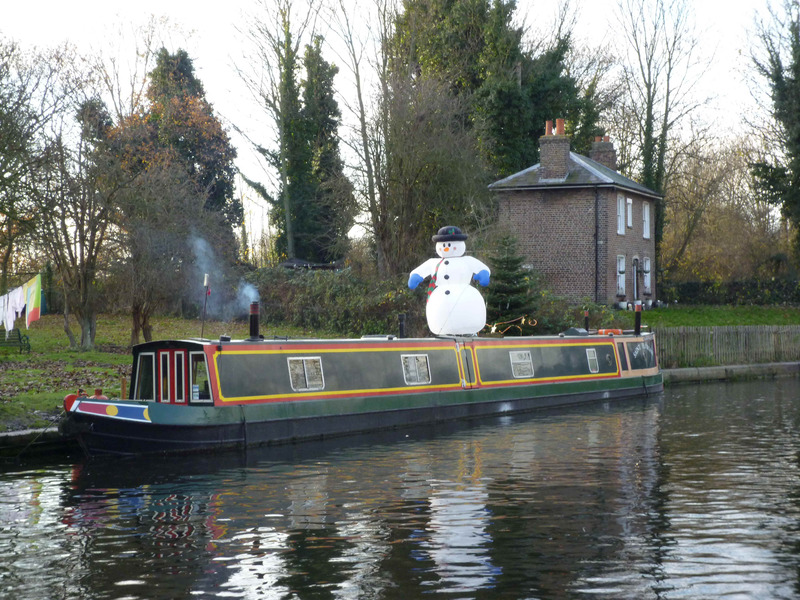 We had a nice chinwag with the lockie at Teddington – he was a cheerful soul. 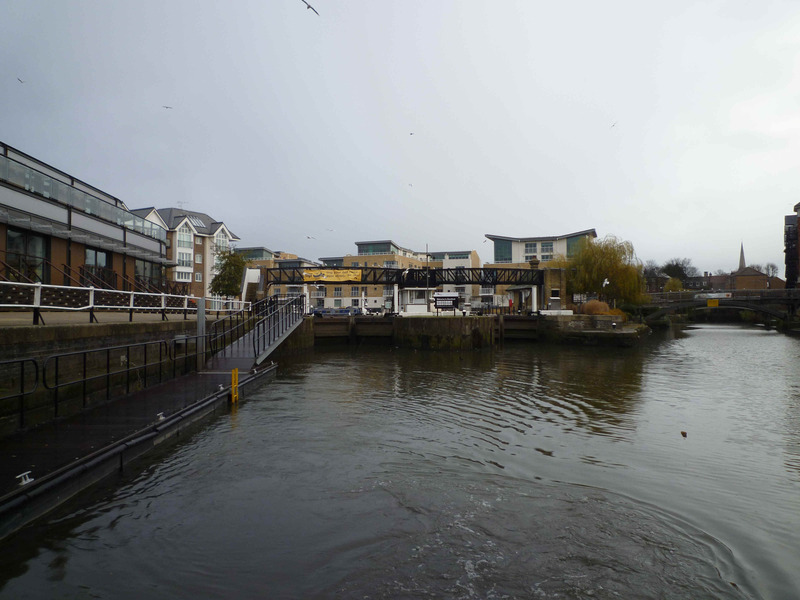 The signs at the lock showed that the river was on yellow “Caution – stream increasing” – this was a bit alarming as we’d thought that the stream was decreasing – the lockie reassured us that the board was wrong! We’ve arranged medium-term moorings direct with the lockies along the length of the Thames for several years, but it was a bit more of complicated this time. 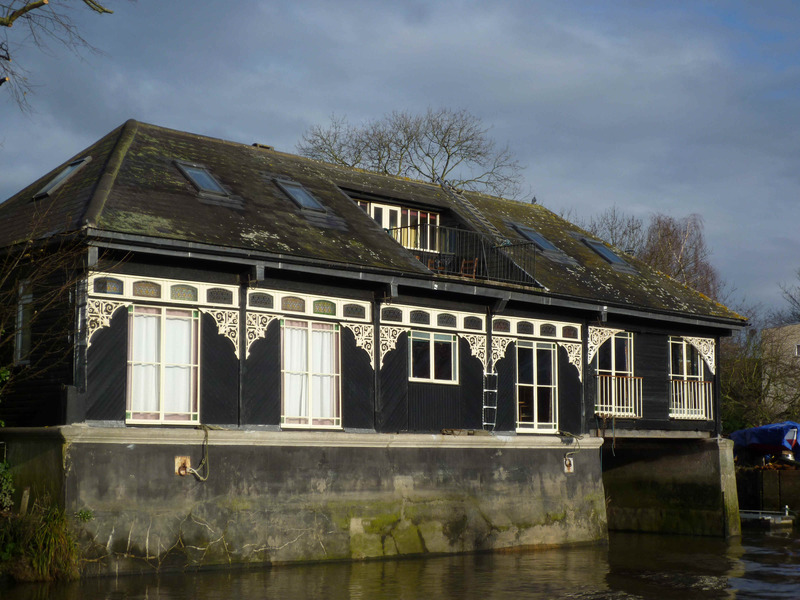 We wanted to moor at Teddington for up to 2 weeks (paid, of course) so we rang in advance to sort it – there was a possibility a few weeks ago that we’d get to the river while it was still on red boards so it was essential that we had a place to stay. However, the lockie on duty that day referred us to his boss. His boss told us that they’re becoming stricter about selling lock moorings because they think that some people have been taking advantage of the red boards to scrounge free moorings. I’m not sure how this works – red boards are red boards and you surely wouldn’t want to discourage people from mooring up safely when they need to. But it sounds as if they’re feeling a bit hard done by, so that’s that. 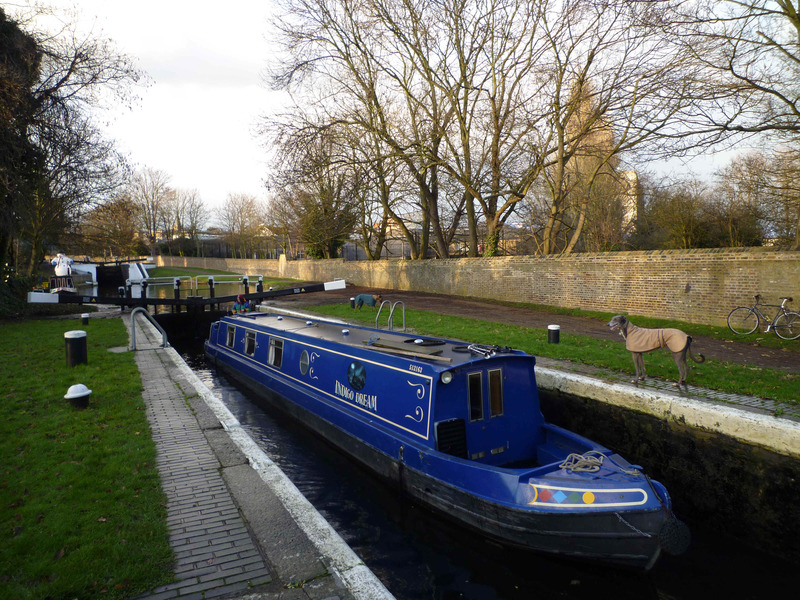 Having reassured the boss that we were definitely prepared to pay for the lock moorings he duly authorised it and we sorted it out with the lockie on the day – £7 a night – very reasonable when you consider the location. 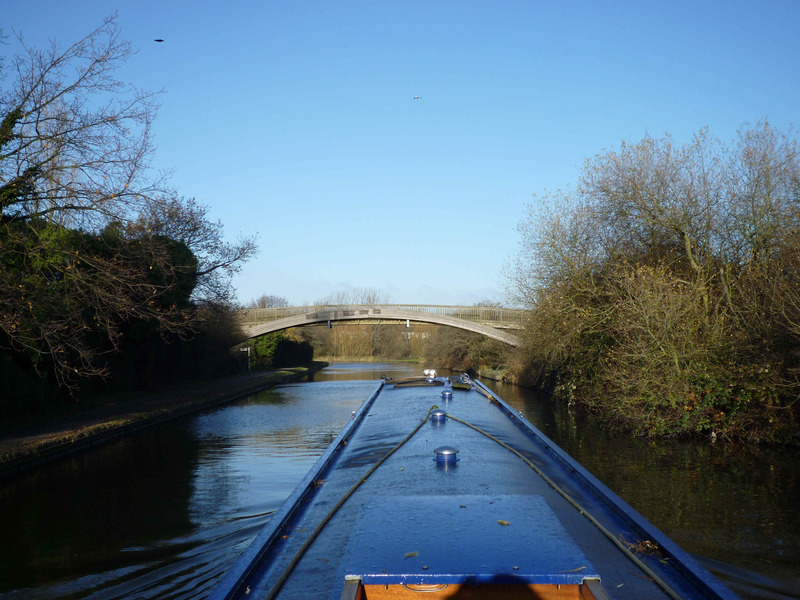 We moored up and our weekend’s cruising ended on a high note with the boat bathed in warm winter sunshine. We spent an hour or so pottering around the boat, and while we were doing that, Blue enjoyed a potter around the adjacent park (supervised, of course). Lou just lay on her bed – she’d hopped off the boat, had a look around and decided that Teddington wasn’t worth the effort. Running the Hanwell flight does wear them out! Despite our great organisation in getting the checklist for the BSS, we seem doomed never to use it. Last weekend Richard remembered the BSS booklet but forgot the boat keys; this time he remembered the keys but left the booklet in his car at home! Ah well, we had a fair idea of what might be lacking so he went round and put stickers in the appropriate places, re-sited one of our fire extinguishers and fitted a new bilge pump. We’ll find out what we’ve missed on Wednesday, when the actual inspection takes place. Where on earth is this dampness coming from? We’ve now outlined the current damp patch with pencil so that we can see whether it’s getting worse. We’ve also left a few portholes and a window open to ventilate the boat to reduce condensation. This may have been a mistake – the temperature’s due to plummet so let’s hope that our pipes are ok. That’s one of the downsides of our form of cruising – we’re not on board to deal with sharp fluctuations in the weather but we’re moving far too much to drain down the system and mothball her for the winter. At least she’s within half an hour’s drive now so we can pop up and adjust the heating, mooring ropes etc as and when it’s needed. In addition to this busyness, we did find time just to soak in the ambience. 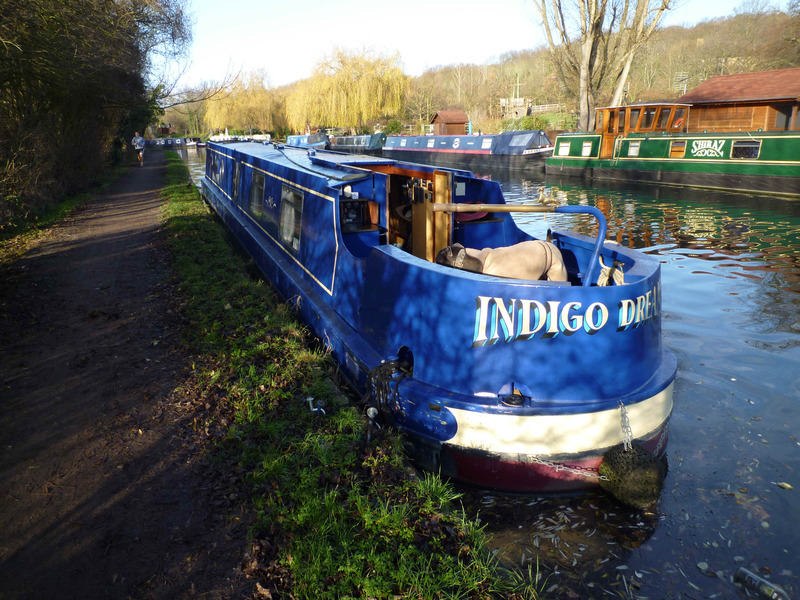 Teddington’s one of our all-time favourite mooring spots; apart from the sheer luxury of the High Street nearby, there’s easy access by car on the Ham side and by train on the Teddington side. There are lots of friendly walkers which makes it a very sociable. It’s hard to imagine getting bored with the ever-changing landscape where the tidal waters meet the weir – it’s fascinating. It’s been a wonderful weekend – maybe because of a combination of interesting waterways and good weather, but mainly because of the company. We appreciated the spontaneity of Simon’s company (he only got in touch on Friday! 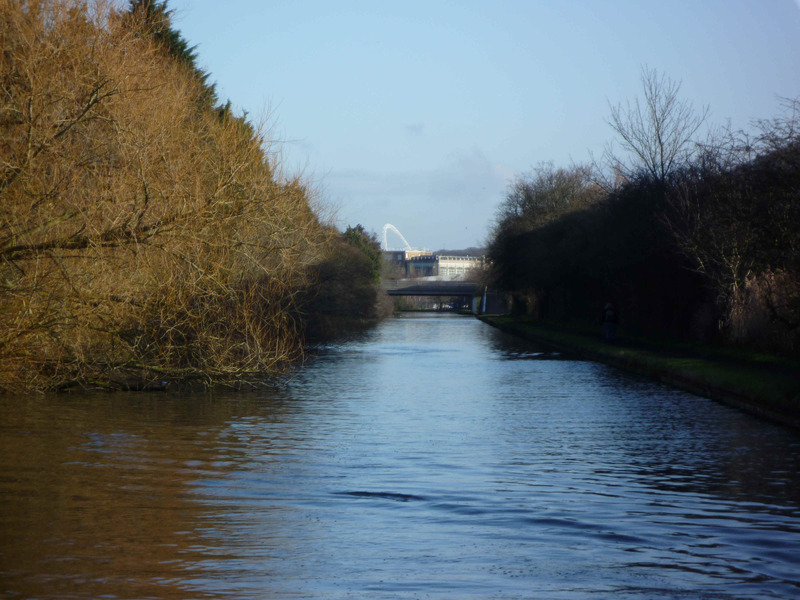 ), and his wit and hard work, then there’s nb Leo’s civility, the efficiency and thoughtfulness of the lockies and the cheerfulness of the towpath denizens. You just can’t beat it. We dragged ourselves off the boat in the early afternoon – our house to-list was calling; it’s still calling – we came home and just sat and watched club rugby all afternoon while the dogs dozed and dreamed on their duvets. 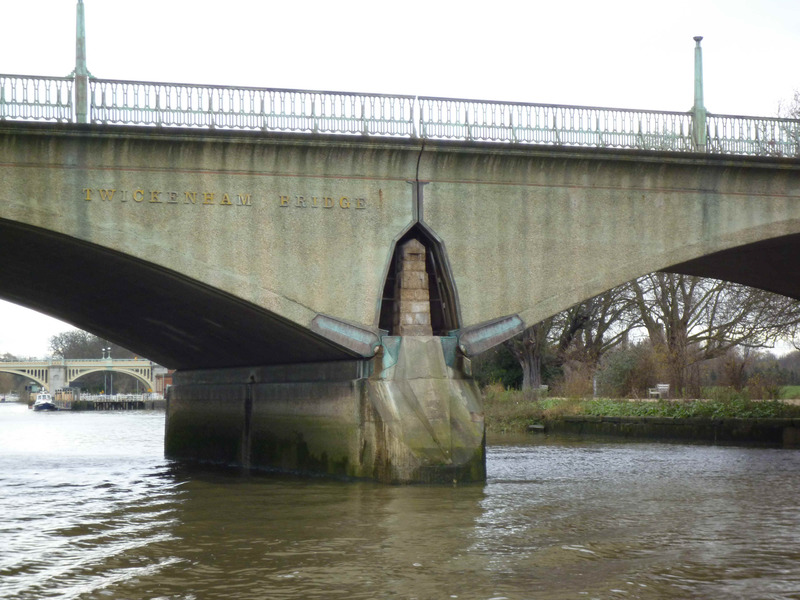 I've never noticed these details on Twickenham Bridge before - the piers all have this art deco detailing; the bridge itself looks more 70's though - interesting! I must check when the bridge was built.